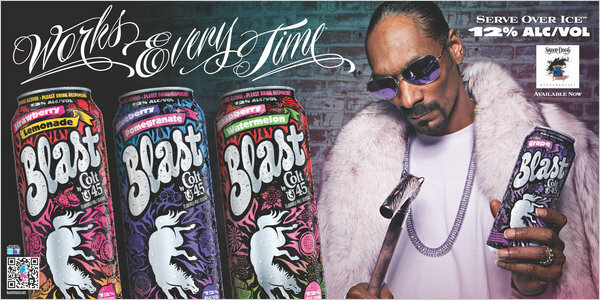 *Maybe Snoop Dogg should just drop his new sponsorship death with Colt 45. The Long Beach native is under fire again for the endorsement. The drink has been controversial for some time and been compared to caffeine and malt liquor drink Four Loko. Blast, the drink in question, contains 12 percent alcohol and is sold in a 23.5 ounce can with labels that kind of look like candy wrappers. It’s bad enough that these flavored, alcoholic drinks attract the young in general; but, it does seem that they are targeting them with the kiddie colors and the artwork and I don’t like it. The other problem lies with the small corner grocery store owners that inhabit our neighborhoods. If they’re anything like those that are here in NYC, they are owned by those who are not of our neighborhood. Most have no problem selling stuff like this to our youth. That in the end is our fault also. We’d rather work for someone else for chump change rather than working for ourselves and being a part of the solution in our own communities. SIGH! to all the folks who liberally used the term “cooning” last week on a different matter, does this apply to Snoop too?